Tis the season of renewal and rejuvenation. As clocks spring forward and days lengthen, there’s no better time to shake off the winter months and spring clean your social media profiles. You see, when people land on your social media pages, your profiles are the first thing they see. Your social profiles communicate your authority, trustworthiness and approachability. And if that’s not enough, they connect you to your audience, leading to enquiries and sales. 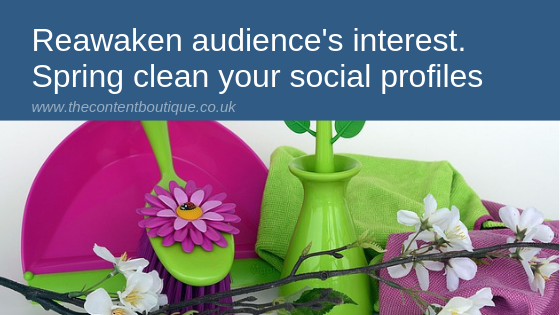 So spruce up your social media profiles and give your audience a positive first impression. OK admit it. When was the last time you updated your social media profile headshot? Ideally, you should update your profile picture every two years, especially if you’ve had a drastic haircut, grown a beard or you’ve lost weight. You want your professional headshot to reflect the real you. Remember, before meeting you for the first time, today your prospective customers and suppliers will likely run a quick search on you online. Elsewhere, following a face to face meeting, your social media profile photos remind people of who you are. Think about the story and the messages you want your headshot to communicate: Confidence, professionalism, agreeableness, creativity or indeed a sense of fun. Perhaps like me, you feel insecure about having your photo taken. Therefore use a professional photographer. They’ll know how to position and light you so that you look the very best you can. Use the same profile picture across social media platforms. It will help people to remember you. Your social media cover photo takes up the most significant visual space on your profile. Treat it as your virtual shop window and show off your brand’s personality. Use it to communicate what your business is and what it’s about. Without a doubt, your cover photo is not a place to use stock photography. Either ask a graphic designer to create a cover photo for you or use Canva to create a professional image yourself. You want to make a memorable impression. One more thing. Make sure you size your cover photo to meet each social media platform’s requirements. There’s nothing more offputting than pixelated, badly cropped images. Think of your bio as an elevator pitch. You want it to be enjoyable, memorable and concise. At the same time, avoid meaningless buzzwords. And remember to include keywords to help people to find you. You have 2000 characters to grab your connections’ and followers’ attention. Use them well. Write a story about who you are, what your business is, where you have come from and where you’re going. Again remember to include keywords (naturally, don’t stuff) to help people find you. Always write in 1st person. LinkedIn is a social network after all. And don’t forget to include a call to action. Make it easy to promote your social media profiles online and offline by claiming a memorable vanity URL. Check your contact information is up to date. At the same time, check to make sure you’ve given your audience all the information they need to know. Fill in all relevant sections. I have an Instagram account. To be honest, I use it more to stalk my teenage son than I do to post useful content to showcase my business. Time to make a decision. Do I use it or lose it? Finally, ask yourself how your social media pages can answer your audience’s questions. Also, solve their problems. Beyond that, help them to stay in touch. Then create or update your content calendar to keep your audience engaged with your newly rejuvenated page. Just as bright flowers and sights please the senses, a fresh and visually attractive social media profile engages and delights your audience. Spring is the time for renewal. So take the opportunity to purge your social profiles of outdated information. Then reawaken your audience with fresh, crisp, clean visuals and content. If you’d like help with spring cleaning your social profiles, in particular optimising your LinkedIn profile, drop me a line, and we’ll set up a time to chat.